Listen to entire album online FREE! First, it’s whom you know, then it’s what you know. Yes, being competent at your job is super important, but not as vital as the people you know and the connections that you have. Your ability to network effectively with your peers, business associates and prospects will greatly determine your personal and career success. The more people you know, the more opportunities you have. If you have a product or service to offer, your success on reaching the end-user is largely determined by your network. Who you know, and who knows you! You have incredible access if you are networked with a good mechanic, police officer, investor, teacher, real estate agent, financial planner, attorney, florist, doctor, engineer — the list goes on! Now is the time to expand and grow your network. 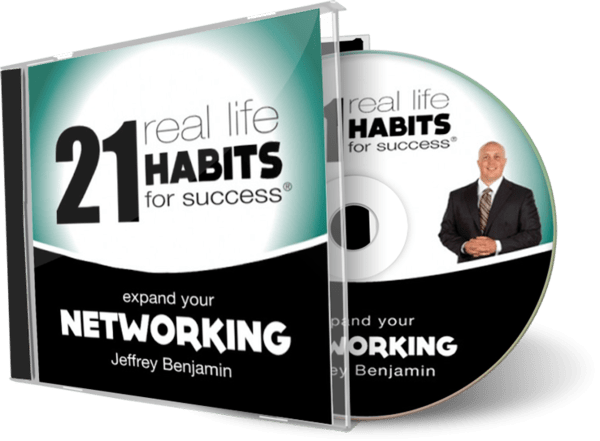 Jeffrey shares 21 habits to expand your networking. Get started today!